Because nothing goes with candy like incessant, heartwarming tears, Pixar and Disney have opted to release a 30-minute Toy Story special this Halloween. Straight up, if you watched Toy Story 3 and didn't start weeping at the end, then you are a horrible monster. Fortunately for your terrible self, Halloween is the perfect time for monsters, and while that's a really rough segue, it's a good enough prompt to mention that a new Toy Story special is headed to ABC just in time for Halloween. 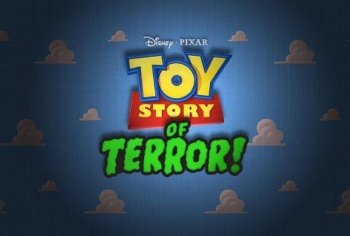 According to TV Guide, the 30-minute show has been dubbed Toy Story of Terror, and it takes place following the maudlin events of Toy Story 3. Thus, as you'd hope, the special will reunite the phenomenal Toy Story 3 vocal cast, while also introducing a "new character," Combat Carl, who will be voiced by under-appreciated action star Carl Weathers. Action Jackson fanboyism aside, you're likely curious about this thing's plot. Fortunately, TV Guide chatted with producer Galyn Susman who was helpfully candid. "Bonnie is on a road trip to go see grandma with her mom and the toys are in the trunk," Susman says. "Mom gets a flat tire and they have to spend the night at a motel and all kinds of chaos ensues." Further, Susman claims that while all of your favorite Toy Story characters will be featured in the special, the focus will shift to Woody's sidekick/love interest/distaff counterpart Jessie. "We've gotten to see a lot of development in Woody and in Buzz and we felt it was Jessie's turn to really show some growth," Susman states. The highest praise anyone has ever been able to offer the Toy Story franchise is that it's not just a great series of movies for kids, it's also a great series of movies for adults. Simultaneously family friendly, yet not patronizing or idiotic is a tough target to hit, but Pixar has an uncanny mastery of such things, and this Halloween special seemingly follows in the footsteps of its cinematic predecessors. "There was some concern early on about not making it too scary for kids," says director Angus MacLane. "I think we've done a good job of balancing staying true to Toy Story and staying true to the genre. As far as adults are concerned, I've always thought that we make these movies for ourselves." "I think it's funny and like the other Toy Story films, I think there is plenty of stuff in there that only adults will get," MacLane adds. So go ahead. Get excited. It's probably pretty safe to say that this special is going to be all kinds of great ... well, unless you're one of those horrible people who didn't cry at the end of Toy Story 3. There's just no hope for those abominations.